Five Minute Friday – Remarkable You! Yes, You. I think you are remarkable. Did you know that? Actually, this stamp set is pretty remarkable too – just look at those big bold flowers. The flowers are so big that they easily can be your focal point, just like on today’s card. 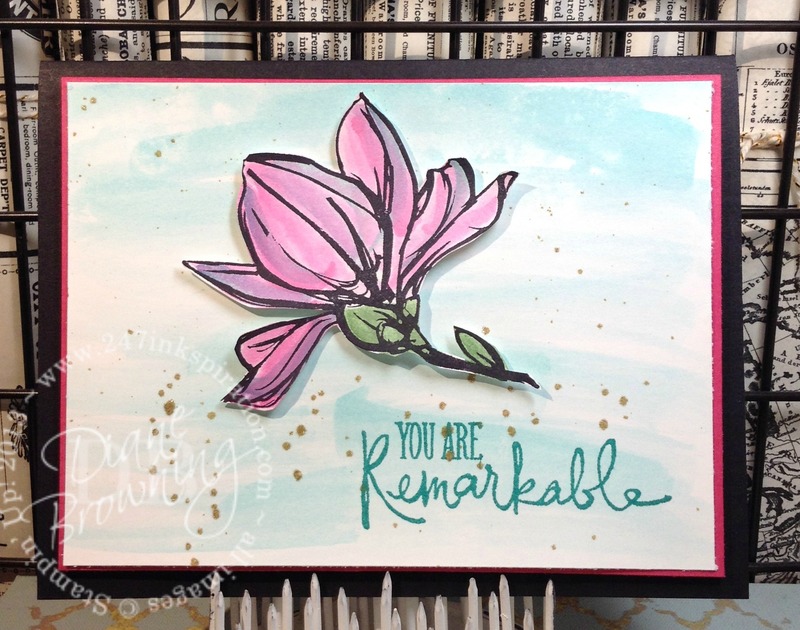 For this card, you’ll want to do your background piece and stamping your sentiment before adhering the flower. I did a light wash of Bermuda Bay across the entire background. I like the uneven look of the color wash because it allows you to use a lot of a bold color without overwhelming the entire card. Then I splattered some Gold Wink of Stella across the front. The sentiment is stamped in Bermuda Bay. I love watercoloring. It can be so quick and easy. One a separate piece of Whisper White, I stamped the flower in Archival Black Ink. Then watercolored it with a light coat of Melon Mambo. I highlighted a couple petals in Bermuda Bay and then went back over them with the Melon Mambo to get a more purple color. The flower is cut out by hand so you don’t even have to worry about staying in the lines. I adhered it to the center of the card using dimensionals. Some people only celebrate big accomplishments. I think all accomplishments big or small should be celebrated. Some days is just as hard to get out of bed and put on pants as it is to solve the worlds problems. This card is for you, to celebrate whatever you did to be remarkable today. I would love to hear about your big accomplishment for the day!